Imagine a Smartphone user is trying to book two movie tickets for enjoying the day with his friend and he has entered the complete details, successfully. And then, he tapped the “Submit” button to get the confirmation of the booked movie tickets. But, all of the sudden the mobile application fails to load the confirmation details. Can you imagine what will the users’ actual mindset or his reaction? Will he try to make a second attempt of booking the movie tickets with the same application? The one and only answer to all the aforementioned questions is a big “NO”. The main reason behind all such impatient behavior is increased expectations of the users as today everything has been made available to the users on a single tap i.e. in the form of mobile applications. Nowadays, there are thousands of mobile applications (including Android as well as iOS) for dealing with every day-to-day life activity from shopping to billing, and from booking tickets to ordering food. After making attempts for 3-4 times, approx. 83% of mobile users abandon a problematic app. If the application starts to freeze, crash or has bugs then, at most 53% users uninstall it. Not only this, if a page fails to get a load within 3 seconds then, 46% users abandon the page. Mostly the users go for normal vendors instead of brands due to poor mobile application performance experience. No doubt, the performance of an application plays a vital role for an application to attain a good success and popularity among users. And this fact has been cleared by the aforementioned statics facts too that if an application becomes unsuccessful to meet the expectations of users then, he will uninstall the application and go for some alternative application. As a result, automatically the rating will go down leading to decrement of the potential sales and revenue. What Factors Affect the Performance of an Application? Network: All application functions on a different network that lays an impact on the application performance as the occurrence of uncertainty within the bandwidth, leads to increment of latency, jitter, and packet loss and thus, the performance of the applications gets degrade. This makes the user feel annoyed. For making, the performances of the application to be optimized on variant network conditions, the mobile application development companies need to build as well as test the applications for all the possible network conditions. App Complexity: Today, a number of features are included within the application like a cloud, third party, data center etc. thus, increasing the structural complexity of the mobile application. As a result of this structure complexity, the chances of the application failure get much increased. App Testing: Nowadays, the developers prefer to develop the application within the simulation lab instead of testing it on some real devices. As a result of this, it becomes quite impossible for the mobile application development companies to understand the actual behavior of the application in an actual environment. This leads to a low performance by the application. Peak Usage: Today, no mobile application company thinks that “How many people are using their mobile application at a particular time?” or “What sort of mobile application features they are using and when?” during the app designing phase. As a result of this, coincidently more than expected users lands to their application platform and the application starts to get crashed, instantly. This slow loading or crashing of the application leads to bad experience and annoyed behavior of the users. Manage the memory consumed by the application, data flow, caching and also limit the memory footprints to avoid the irrelevant resources within the app. Make a proper attention towards network security, vulnerability and identity management for making a concern towards security factor. Optimize the CPU, GPRS, Network/Wi-Fi, and desk for avoiding the power consumption. 2. Offering fewer features: It is not mandatory to include a number of features within the application as including a number of features may compromise the performance of the application. Every user has a preference towards getting a faster and functional application instead of one with a large number of features. 3. Preferring Native App Development: The developers may go for the option of native applications, as these applications are designed for OS users’ device that executes smoothly on iOS and Android, easily. The native apps run much faster and functional on devices than the other types of applications. 4. Load data as per required: It has been noticed that some applications need to load data in bulk for its proper functioning and to wait for this much time is not possible for the users. To deal with such situation, it is possible for the mobile development companies to divide the complete data into two parts i.e. pre-load and post loads so that the users may make an access to some parts of the application while the other pages get successfully loaded. 5. Creating an offline mode: All the users do not have the tendency of sitting at a fixed place and then using mobile application. They simply use the application whenever they are either standing in a queue or migrating from one point to another. And thus, due to such scenarios the possibilities of network connection loss in between, so this has been recommended to mobile app developing companies to create an offline in order to store the users’ data during the connection fall off. 6. Updating the Software Versions: When the developer designs an application, they test it over all the latest devices and thus, the compatibility of these applications are much with all the latest software and tools. Thus, this has been recommended to keep the mobile software updated with the latest software version. This also helps to enhance mobile security and optimization too. 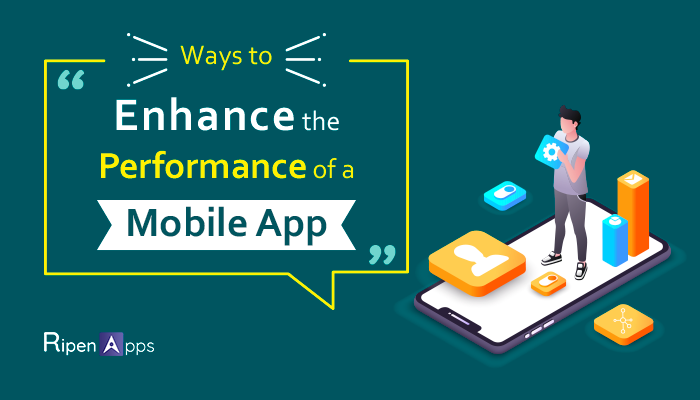 The performance of an application has a direct impact on the number of users using the application on their devices, retention rate, conversions, as well as the app revenue generated. Thus, by following the aforementioned points during the designing and testing phase of an application, all the mobile application development company can easily make a good success in giving a high quality to its users through their application.